Fruitland American Meat, a Jackson, Mo. establishment is recalling approximately 4,012 pounds of fresh beef products because the dorsal root ganglia may not have been completely removed, which is not compliant with agency regulations that require their removal in cattle 30 months of age and older, the U.S. Department of Agriculture’s Food Safety and Inspection Service (FSIS) announced today. The products were produced and packaged on various dates between September 2013 and April 2014. The bone-in ribeye roasts were the source material of concern. 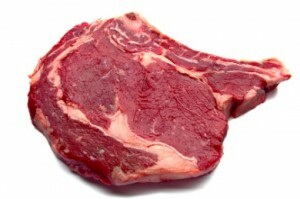 Fruitland American Meat advises that the bone-in ribeye roasts were distributed to a restaurant in New York, NY, and a Whole Foods distribution center in Connecticut which services its stores in New England. The quartered carcasses were distributed to an FSIS-inspected establishment in Missouri for further processing and distribution, and to a restaurant in Kansas City, Mo. All products would have been processed into smaller cuts with no identifying consumer packaging. The problem was discovered by FSIS during a review of company slaughter logs. The problem may have occurred as a result of the way some company employees were recording information and determining the age of various cattle. Dorsal root ganglia, branches of the nervous system located in the vertebral column are considered specified risk materials (SRMs) and must be removed from cattle 30 months of age and older in accordance with FSIS regulations. SRMs are tissues that may contain the infective agent in cattle infected with Bovine Spongiform Encephalopathy (BSE), as well as materials that are closely associated with these potentially infective tissues. Therefore, FSIS prohibits SRMs from use as human food to minimize potential human exposure to the BSE agent. Every animal received ante-mortem inspection by an FSIS Public Health Veterinarian. This involves observing each animal at rest and in motion and there is no indication that any of the cattle slaughtered displayed any signs of BSE. FSIS and Fruitland American Meat have received no reports of adverse reactions due to consumption of these products. Anyone concerned about a reaction should contact a healthcare provider. Consumers and media with questions about the recall should contact company sales manager James Fortner at 573-243-3107.